What’s a Cybil?The Cybils awards are given each year by bloggers for the year’s best children’s and young adult titles. Who can judge?We ask for volunteers every August from the book-blogging community. Generally, our judges must contribute at least monthly to a blog that’s primarily about children’s or young adult literature. These are not popular-vote awards, but juried awards by select judges among the very people who read and review YA books every day: book blogging community. Nominations are open to all books (both traditionally published and self-published). 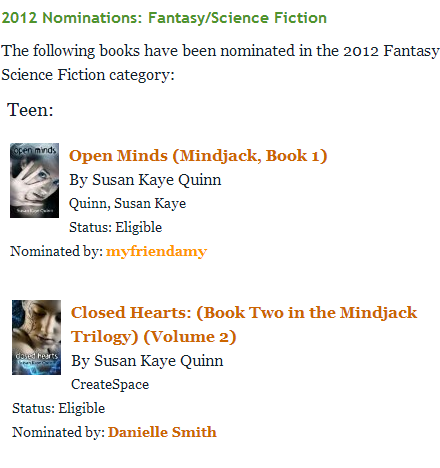 Open Minds and Closed Hearts have been nominated in the Young Adult Science Fiction and Fantasy Category. There are many, many amazing books nominated, so the competition is stiff. I’m excited just to have my books counted among them, and for the books to be exposed to new book bloggers because of it. I’m trying hard not to dream of making it to the finalist list (although last year Angelfall, originally a self-published book, now published by Amazon’s Children’s Imprint, made it to finals for the first time! Go indie!). Thanks A.G.! And good luck to you with your Scourge nom!! Wonderful news! Best of luck moving to finals and beyond. YAY! Congratulations. This is very exciting! I'm glad to see that quality work pays off in the New Publishing World. Perhaps more so than in the Old World. If they have any sense, you'll win.